Our popular mid-sized heat treating furnace contains a 1 cubic foot (28l) usable zone capable of temperatures up to 2200°C and can be equipped with numerous options. 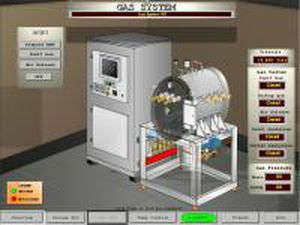 The unit shown features a turbo system and our HMI computer interface package. 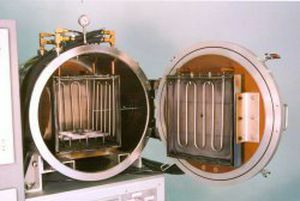 Other options include operation in Hydrogen, diffusion and cryogenic pumping systems, a heat exchanger for rapid cooling in gas, pyrometer, etc. We customize our furnaces to your specific needs. The hot zone features tungsten rod or mesh heating elements, ensuring excellent uniformity and longevity. 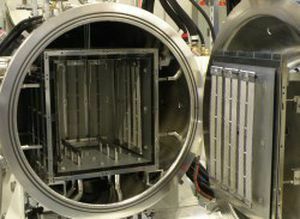 This furnace comes equipped with an intuitive and easy-to-use computer interface, allowing fully automated runs. It provides Data acquisition, display and logging of alarms, unlimited recipe profiles for temperature control, security, configuration settings, etc. The PC is an industrial flat panel PC mounted in the control console and is built to withstand harsh environments.